The weather is nice and it is time to get out your bike. Bicycle riding is one of the easiest ways to stay fit, promote cardiovascular health and improve muscular endurance. It is a relatively inexpensive exercise to be enjoyed by the whole family. However, a correct bike fit is essential. Did you know that in a one hour bike ride, the average cyclist completes over 3000 strokes? If your bike does not fit, your joy of bike riding can easily turn to pain. A bike that fits properly – frame size, alignment of the pedal and foot, position of handlebars and saddle height – promotes good posture. According to the Canadian Physiotherapy Association, each spring and summer, Canadians suffer from all kinds of aches and pains including knee problems, neck and low back pain and fatigue because the distance between the seat and handlebars is too great or the saddle is not at the correct height. Cycling should be about fun not pain. Proper fit will minimize discomfort and ensure safe bike operation. A few simple modifications can dramatically boost performance, increase comfort and reduce the risk of cycling induced injuries. FRAME SIZE: The first step to proper bike positioning is to make sure you have the right bike frame size. Stand over your bicycle's top tube (between the saddle and the handlebar). The general rule of thumb for road biking is to have roughly one inch of clearance between your buttocks and the frame. For mountain biking on trails, you should have two to six inches depending on the terrain and the slope on which you are riding so that you are nice and compact and can easily put feet down quickly. SADDLE POSITIONING AND HEIGHT: The saddle should be level for endurance and recreational riding. If you are sliding forward from a forward-tilting saddle, your arms and back will be taking too much weight. If the seat is tilted backwards, you may place undue strain on your low back and may experience discomfort or pain in the saddle area. Saddle height should be set so your legs are not quite fully extended at the bottom of each peddle stroke. The straight leg should have a slight bend in the knee, roughly 30 degrees. If you have to shift your seat with each stroke, your saddle is too high and needs to be lowered. HANDLEBAR POSITION: The handlebar's position can make a difference to the comfort of your back and upper body while riding. Handlebars that are too low or too far forward force you to stretch and bend down too far, placing undue stress on your back and neck. Higher handlebars will have you put more weight through the saddle. Generally, taller riders should have lower handlebars in relation to the height of the saddle. SHOE/CLEAT ALIGNMENT: If you ride your bike with clip less pedals, the position of the cleats on your cycling shoes determines the comfort of your feet, ankles, knees, hips and back. Misaligned cleats can put stress through all joints from your foot to your low back with every pedal stoke. Your feet should point straight ahead when clipped into the pedals. The rule of thumb is to adjust the cleats so there is no twisting stress in your leg as you pedal. BICYCLE SAFETY: Cyclists must track multiple objects simultaneously while riding including surrounding vehicular traffic, parked vehicles and pedestrian traffic. Road safety skills are critical to help prevent serious accidents and injury on the road. Most importantly, your bicycle must be road worthy and in good condition and you should be wearing the right equipment. Helmets are critical for safety and should be worn properly to prevent serious head injuries. CYCLING WITH CHILDREN: Set an example by wearing helmets properly, using mirrors and obeying the rules of the road. Always ride SAFELY! 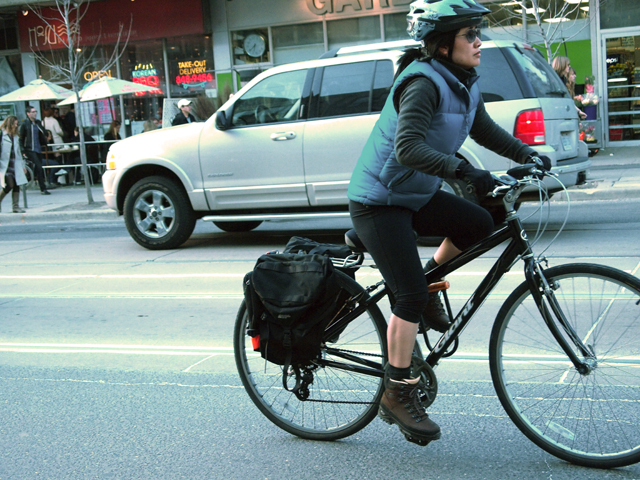 BE SEEN: Cyclist who stand out are safer. Make sure that you have working lights. The Highway Act requires reflectors and bells. Cyclists need space. Ensure you know what is around you on the road. Use hand signals before you start to turn, always be on the lookout for car doors being opened by motorist and avoid open cracks in the road and loose gravel. MELT is a proactive approach to maintaining a healthy, pain-free, active life for living longer…better. Copyright 2019 Personal Best Physiotherapy, Pilates, Rehabilitation. Watermark theme. Powered by Blogger.